Intuit is running a competition to award over $300,000 in grants to small businesses. 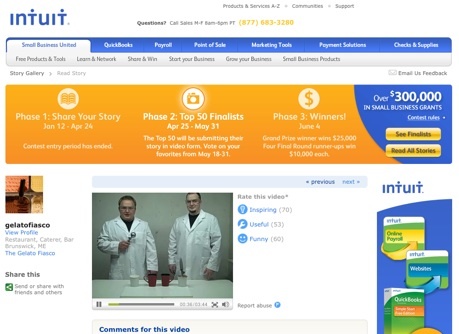 Contestants submit videos of their ideas to the Intuit site. The whole thing is powered by Brightcove. This kind of campaign can be a great way to stimulate awareness and engagement with your brand. Intuit has tapped into the creativity and entrepreneurial nature of their small business customer and prospect base by offering a win/win proposition. I am hoping we can convince our friends at Intuit to share their key campaign metrics and lessons learned. Stay tuned.